MONTREAL – In a press conference Wednesday morning, Mr. Geoff Molson, Owner, President and CEO of the Montreal Canadiens, Bell Centre and evenko, announced significant investment plans that will delight Canadiens supporters, live music and special event fans, the business and tourism communities, as well as Montrealers in general. Mr. Molson announced an investment of close to $100 million over a three-year period earmarked for the interior and exterior spaces of the Bell Centre. 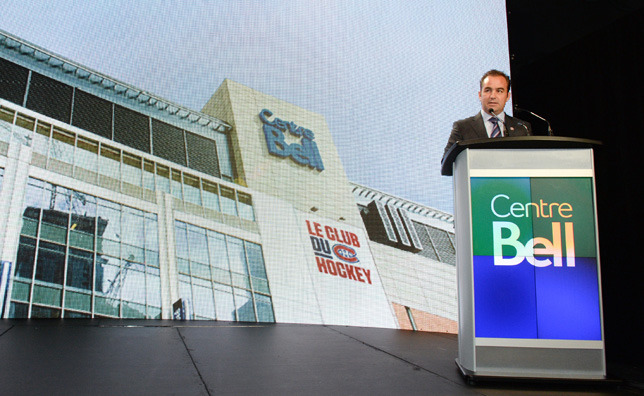 “This major investment is intended to maintain our standards of excellence and to ensure the quality of the Bell Centre visitor experience,” said Geoff Molson adding that the work has been planned carefully so that it will not in any way interfere with the activities at the Bell Centre. “For 20 years, the Bell Centre has been a leader of the entertainment industry and is one of the busiest arenas in North America. We are proud of the Bell Centre’s role as a catalyst of the Quebec economy and its contribution to building Montreal’s reputation around the world,” he added. Among the key projects in the action plan is the construction of a new major sports restaurant, the details of which will be announced in the coming months. Also included are plans, which have been presented to the City of Montreal, to transform the Avenue-des-Canadiens into a pedestrian street and to construct a spectacular new glassed-in entry hall to the Bell Centre, which would also serve as a pedestrian passageway accessible to the public. Nearly 20 years ago, the Molson family initiated a project that would have a major impact on Montreal’s cultural and sporting scene and that would create immense benefits, both economic and touristic, for the city, the province and the country. Entirely built with private funds, the Molson Centre, now the Bell Centre, has been a symbol of excellence ever since. A KPMG study1 of economic impact confirmed that the Bell Centre is in fact a major catalyst of real estate development in downtown Montreal and an important economic driver for surrounding businesses. The Bell Centre is at the heart of a recent real estate boom that resulted in the construction of ten new buildings so far, the property taxes of which could eventually exceed $70 million annually for the City of Montreal. The activities of the Bell Centre, the Montreal Canadiens and evenko attract 2.9 million visitors annually and contribute $338 million to the Quebec economy. To this amount should be added the $108 million that the 2 million visitors that the Bell Centre alone host annually spend in hotels, restaurants and businesses surrounding the Bell Centre. The cultural, sporting and family-oriented events of the Bell Centre, the Montreal Canadiens and evenko also benefit tourism and employment. These events attract some 272,000 tourists from outside the Province of Quebec to the city and contribute to creating more than 3,400 full-time jobs.